« Windows 7 64 bit problems Update Solved? This is just a quick update on the status of my next game The Occult Chronicles. Things are moving along well. Not as fast as I would like but the ball is being advanced. I had to go back and redesign some of the game systems because of an idea that struck me while I was doing design work for a more classic 2 player turn based strategy game for down the road. I like to take breaks from the drudgery of doing UI work or data entry and work on designs in my notebooks. I was playing around with dice this time and it struck me that it might be cool to add some type of customizable dice to the game that the player would acquire and manipulate like he did other items i.e. weapons, spells, special abilities etc. So I came up with the idea of bones. You can collect them and use them in a lot of instances where the game wants you to determine a random outcome. The strategy aspect comes in the way you can pick which die you want to use from your collection and how you upgrade the dice. Right now these are mostly triggered by using items in you inventory. Say you have a pistol and you trigger its action during a challenge, then you might need to pick a bone or two from you collection and roll them. If you get over a certain threshold number then the pistol’s action is successful and you can proceed to use it during the challenge. That’s the general concept. The bones don’t have pips though in general. They have swords, cups, wands, and pentacles. You can also bump up the values on individual faces as you upgrade them. You might start with or find a basic die with 3 blank faces and 3 faces with 1 sword on them. Later you might change a blank face into another sword or bump a face up to 2 swords. You can also upgrade the die by changing it from a d4 to a d6 (which means the max face value can now be 6). You will need to build your dice pool up to synergize with your character’s abilities and items. 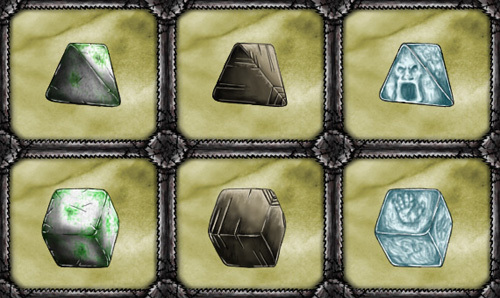 Here are some of the dice you might come across in the game. You can click on them in your inventory to see the layout of their face values. This entry was posted on Thursday, February 9th, 2012 at 6:12 am	and is filed under Occult Chronicles. You can follow any responses to this entry through the RSS 2.0 feed. Both comments and pings are currently closed.